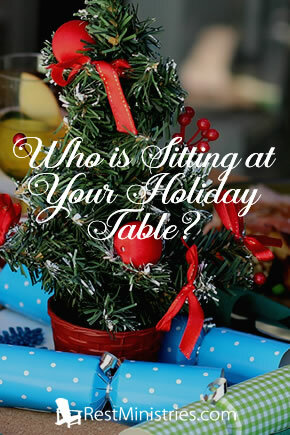 Who is Sitting at Your Holiday Table? Whether your family gathers around your table or you are honored to join another family during the holiday season, we can count ourselves blessed. Diane shares. “Children’s children are a crown to the aged, and parents are the pride of their children” (Proverbs 17:6). Often during this season we are blessed to spend time with family and friends, gathering together, be it for dinner or just to hang out. I realized for our family that this would be the first year there would be four generations present. I couldn’t help but reflect on my past childhood memories. There was a children’s table, an adult table, and a table set with food. My Mom was amazing. Though she suffered with severe lupus, she prepared for days, and when we were all together, she was smiling, happy, and rejoicing. I know now, as an adult who also suffers with chronic illness, that she was in pain, but her joy in the Lord and for serving overpowered that pain for a short time her goal was to share the true love of Christ with all who were there. I love the version of this verse in The Voice: “Grandchildren are the crowning glory and ultimate delight of old age, and parents are the pride of their children.” For myself it fully describes the depth of this tradition of family, respect, and of course deep love. The tradition of the full table passed to me when my mom went home to the Lord some twenty-seven years ago. I often pictured her as she joyously laid that crown before him, a sweet gift of love to her King. As I prepare the tables this year, I will rejoice anew, thankful of this gift, and look forward to the day I too will lay this crown of love at my Savior’s feet. Prayer: Father I lift up each individual who reads this today. I do not know what their table is like, but You do, Lord. I humble ask that You would fill them with Your love. Let them know You are present. You are seated right there beside them, loving them. I thank You that we are all part of Your family, and that one day will all sit joyously in heaven, at a table with You. Until that time comes to pass, let us remember to share our table wherever it may be, filling it with not only family, but friends, even strangers; that we can share your son Jesus with them all. Amen. Do you have a table story to tell? Perhaps a childhood memory that is dear to you? Take a moment share with us, let us each be joyful knowing Jesus’ love is reflected in the love we share with others. Filed Under: Devotionals, Holidays, Reflection, What's New?